A few SOAR ladies and their special event station. The ladies of S.O.A.R. 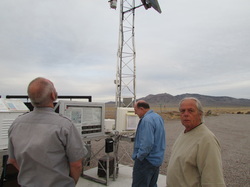 the Sisterhood Of Amateur Radio, kept a sharp lookout on both the skies above and the airwaves around Nevada's most notorius piece of real estate, the Groom Dry Lakebed, AKA "Area 51" when they recently set up a Special Event station and skywatch in Rachel, Nevada. 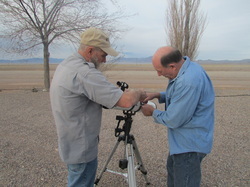 Armed with an array of telescopes and radio gear they attempted to have a "Star Party" and to enjoy night skies which had promised a comet view and other celestial events. Under the guise of star gazing, they also planned to brazenly scan the skies in their vicinity for signs of activity by any number of alien creatures which are reported to frequent the locale. Nevada is well known for having crystal clear night skies. Yet, mysteriously almost to the second that their telescopic equipment was aimed at the night sky a huge cloud blanketed the heavens from horizon to horizon. Even the brightly shining full moon disappeared in an instant. It is the consensus of all those in attendance that their mission had become compromised. Could our government be involved? What hideous life form have these poor ladies stumbled upon? Armed with the very latest in wireless technology the SOAR ladies wasted no time in intercepting a signal in the 5 GHZ band which was apparently radiating from a source known as the "Little Ale'inn". Via this captured portal they were able to intercept data from three thinly veiled emmiters. A clandestine calling itself the "WEATHER UNDERGROUND" and not only one, but two U.S. Goverment operatives calling themselves "NWS" and "NOAA"! It should be noted that using skills far too advanced to be understood by the average electronic enthusist, the ladies were able to pierce the cloak of secrecy and access government satellite imagery being shared by all three sources which clearly showed the layer of thick vapor which was being floated above the entire area over and adjacent to "Area 51". Further, these communiques indicated that the vapor would remain until daybreak, be removed, and then once again be placed in the skies above "Area 51" the following night. Information gleaned from the three operatives showed that no such vapor layer was planned for any of the nights following the ladies scheduled departure! Where did this thick sky blocking vapor come from? Why did it's mysterious appearance, dis-appearance, and re-appearance co-incide with the ladies scheduled observations of the skies over Groom Dry Lake? When undertaking their expeditions the ladies of SOAR often make use of tribal bearers who refer to theirselves as the OM's. Rugged, yet simple minded folk, the OM's seem willing, nay, eager to complete whatever chore is assigned to them. It appears that their only reward is a small ration of warm beer and badly charred frankfurters. Several studies have been made of the OM's and many experts believe that they are attracted to the shiny knobs and bright LCD screens of modern radio equipment. It's not unusual to see one or more of the OM's gather near a radio and break out in their ritualistic, sing song chant,"CQ Contest, CQ Contest, U R 59 59, CQ Contest." The SOAR ladies report that while appearing harmless, care must be taken to prevent an OM from beginning the chant. The ladies state that they each have witnessed numerous occassions when one of the OM's will begin the Contest chant and not be able to stop for 48 hours! All of the SOAR ladies agreed that it is best to keep your OM busy and away from your radio. Despite their shortcomings the OM's appear to be keenly aware of their natural surroundings. As the night turned into day, several of the OM's alerted on a scent from a sinister building in close proximity to the SOAR encampment. The animal instincts of the OM's took hold and they sprinted toward the building. The SOAR ladies cautiously followed the OM's to the building. Upon inspection it was noted that the structure was labeled "Little A'Le'Inn" "Bar and Restaurant". The simple minded OM's dashed into the building, oblivous to the dangers of entering this apparent decoy. Was this NOAA? Was this the desert refuge of the "WEATHER UNDERGROUND"? The signs of deception were everywhere. Once inside the Little Aleinn/NOAA compound it became apparent that something was terribly wrong. The carcuses of freshly slaughtered beings were openly hung on hooks. The 5 GHZ wireless portal was in plain view. Huge jars labeled "Alien Jerky" clearly contained the dehydrated flesh of some unfortunate space traveler. A very human looking being appeared and insisted that the SOAR ladies join the OM's in devouring "Eggs and Alien Steak Burger smothered in onions. Everyone complied. Soon the humanoid appeared and instructed everyone to quickly consume the onions as another humanoid was approaching and the smallest hint of onions would cause its death. Krptonite and onions evidently are fatal to space beings. SOAR retreated from the compound. Following a guarded retreat the SOAR ladies were safely outside of the building only to find the OM's fixated on a steel tower laden with strange equipment. Lots of signs proclaimed that this equipment was measuring atomic fallout exposure. The signs also stated the entire area was being monitored thru the joint efforts of the Atomic Energy Commission and NOAA! The situation for the SOAR ladies appeared dismal. NOAA's reach appeared to be endless. Had they and their allies snuffed out the moon and stars. Were they the ones responsible for the harvesting of innocent space travelers to feed the appetites of the patrons of the Little A'LE'INN Bar and Restaurant? Were they able to control the humanoid workers thru the threat of death by onion? ....and most importantly could NOAA and the "Weather Underground" destroy the sun? With no time to waste the ladies of SOAR point their instruments toward the sun and quickly scan its surface. They soon find that all is not well with the sun. A huge explosion has taken place. A fiery plume extends from the sun's surface and travels tens of thousands of miles into outer space. Huge storms are raging across its surface. Numerous spots dot the image. 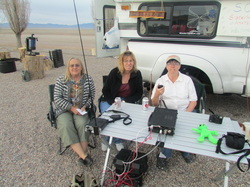 it's time for soar to "phone home"
The SOAR ladies turn to their radio to let the outside world know that they are sitting at the edge of "Area 51". Their Special Event Station allows them to reach out to the world and beyond with their special message of amateur radio fellowship. The first call crosses the border and reaches Canada, they report their special activities to the Canadian ham. Now, regardless of what else happens, the world knows that they were there. They communicate with stations all across North America. 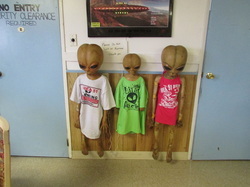 Everyone they talk with wishes them luck and urges them to remain vigilent in the face of the unknowns of Area 51. As the morning wears on, the confidence of the aliens improve and letting their guards down, they begin to appear. Most of them take on very humanistic features. 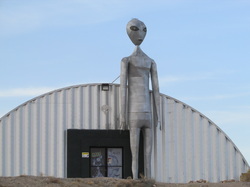 The first to make itself known, pretended to be lost and needed directions to Area 51. His thick accent gives him away and nobody believes his claims of being from "Hungary". Hit and run accident by "Undocumented guest worker"
A deputy sheriff shows up at the Little A'LE'INN, and verifies that some of the humanoids at the bar are indeed aliens. He tells the SOAR ladies that all of the aliens in the area eventually make their way to the "black mail box." He also tells them that the mailbox is really "white". 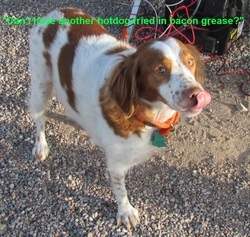 On their trip away from Area 51, one of the SOAR ladies and her OM encounter the "Hungarian" along the side of the road. He is now accompanied by an attactive female counterpart. There is a large, stiff, cow laying on its back with its legs frozen toward the sky. What fiendish thing has the SOAR lady interupted? The "Hungarian" tells her that he has just came from the "Black Mailbox"......there's no doubt about it.....this guy is "Weather Underground" through and through. The SOAR ladies encounted this structure which appears to be some sort of alien temple.